What Is Big Ant Dirt Track Racing? Home / What Is Big Ant Dirt Track Racing? From 2003 to 2010, Big Ant Studios created a series of dirt and oval racing video games for PC, Playstation and XBox consoles. Since that golden age of racing, the landscape has changed. Publishers either no longer exist or don’t have deep enough pockets to pay the drivers, tracks, licenses and let alone the developers. In the meantime, Big Ant has been busy building the engine, tools and technology to power faithful sports simulations on the next generation of consoles and PC. Dirt racing is in our roots just as much as yours. It’s high time that fans of dirt oval racing had an updated platform on which to create and compete. That time is now, and this is where you come in. 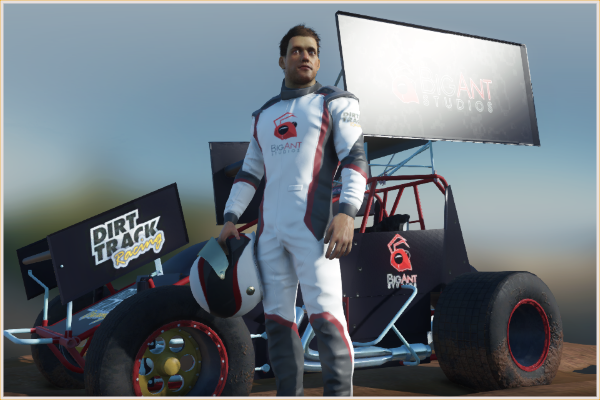 Dirt Track is a community driven video game supported by financial and technological investment by Big Ant Studios. Core to the project is that anyone who wants to be involved can grab the wheel and control the direction of the game through this website. Once on board, you will be able to take part in the development of the features of the game as they are built. By contributing to the project, team members are able to play features of the game through regular Steam PC updates, decide on included content, drive vehicle handling choices so the game is just how you want it to be. The next great dirt racing video game will only exist in our imaginations unless we can harness the enthusiasm of the real fans. Anyone who follows dirt racing will tell you how down-to-earth the sport is and that’s why a connection to our fans is key for making a game together. Big Ant brings the tech, you bring the ideas. Checkout our funding & feature unlocks to see where we can take this game, together.